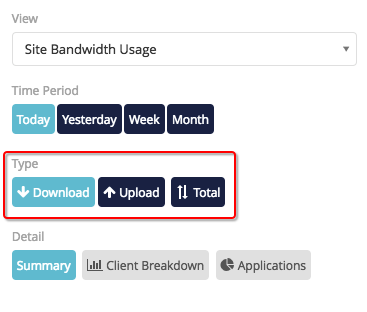 In the Connect Bandwidth Graphs, you can view bandwidth usage across your sites, as well as usage by individual clients, allowing you to effectively manage services, troubleshoot problems, and get the information you need to up-sell clients onto more sophisticated services. You can also view a client's individual graph to get a more detailed picture of their bandwidth usage. 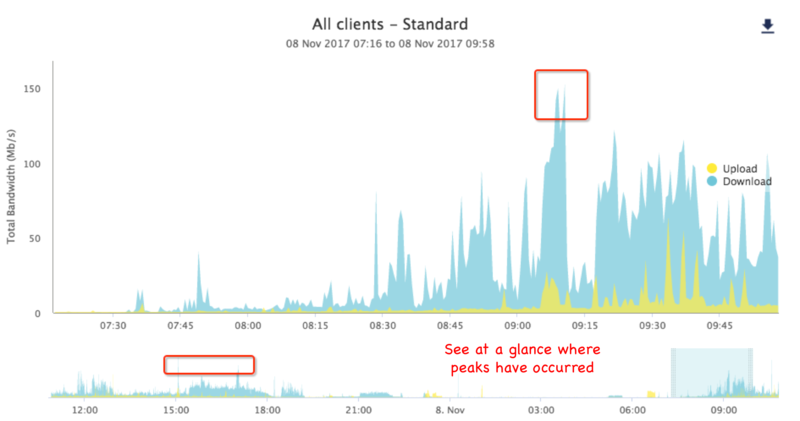 Recognizing upselling opportunities - find out if you have capacity to utilize more bandwidth, and take advantage by pursuing upsell opportunities with your members (you can use the Pipe and Client graphs to find out which clients are your heaviest users). 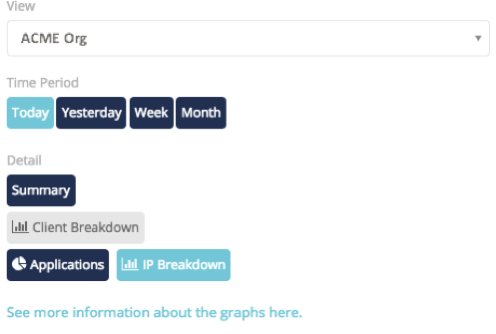 Bandwidth Manager lets you see a breakdown of a client’s bandwidth by IP address with the new IP Breakdown graphs. Choose a client in the dropdown menu then click the ‘IP Breakdown’ button. You will see a bar graph that will breakdown the bandwidth usage by IP. You can now identify which IP address is using most of a client’s bandwidth. Your first view of the Site Graph will display the total download of each of your pipes at your selected site. 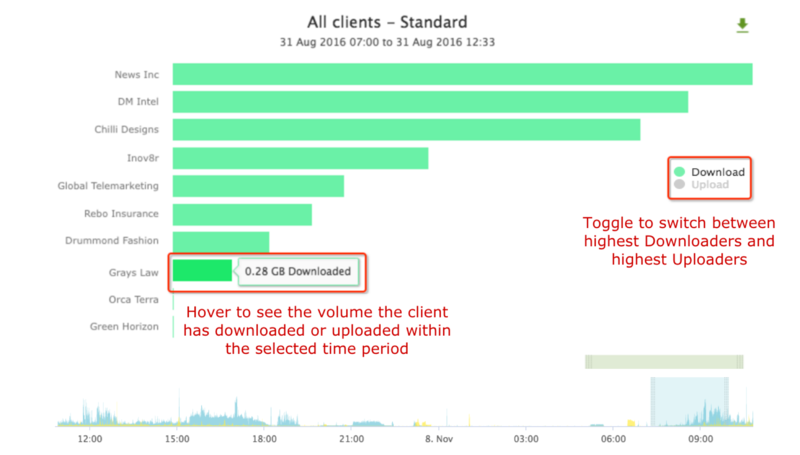 Unlike the other bandwidth graphs on which data is overlaid on top of each other, this graph is stacked to allow you to see the total download amount. The threshold displayed is your circuit size - the total amount of bandwidth which can be used at your site. To see a more detailed view of your data, select Hide Threshold, and the graph will rescale to the highest data point. Each pipe is displayed on the graph. 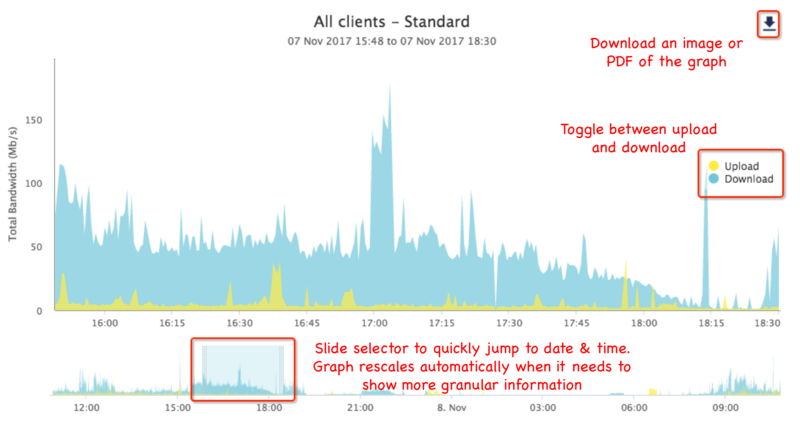 If your site has multiple pipes, you can add and remove these pipes from the graph by clicking the graph name within the key. By default, you will see the data by download only. You can choose to just view uploaded data, or both download and upload. You can download the graph, and switch between download and upload views. 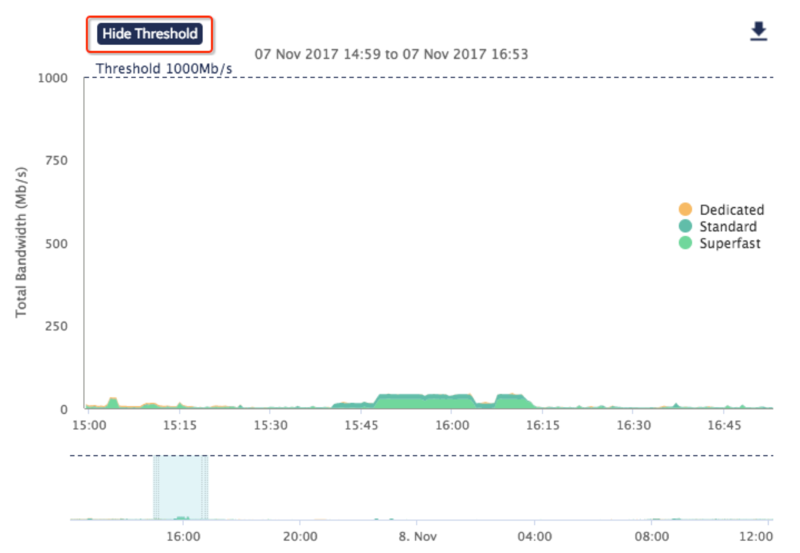 You can see an overview of each of the shared bandwidth pipes at your site to see how heavily they are being used, and to find out which customers are using the most bandwidth. Select a shared pipe from the 'View' drop down. You can see the combined download and upload across the pipe. 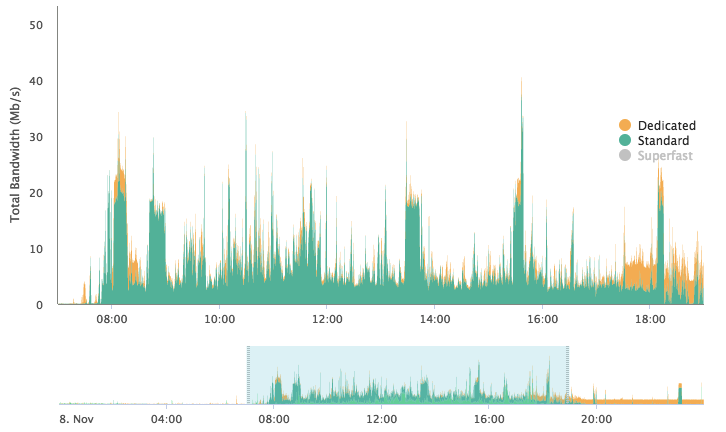 The pipe threshold is displayed at the top of the graph and you can see where peaks have occurred in the usage. 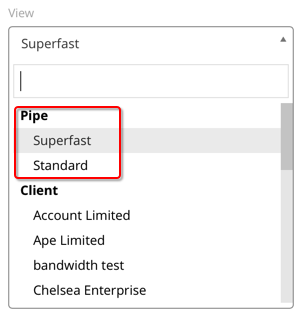 To find out which customers are using the most bandwidth on the shared pipe within a selected time period, select ‘Client Breakdown’. You will see clients with the highest downloads within the selected time period. Select a client from the list to view more detail about their use over the past month. 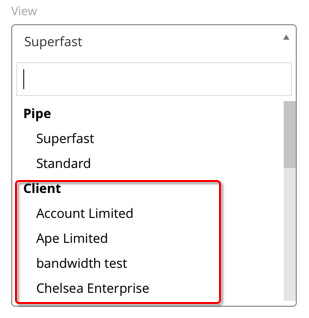 Select a Client from the drop down to view their individual bandwidth usage. The pipe which the client is associated with is displayed at the top of the graph. If the client is on a dedicated pipe, their threshold is shown, and you can see at a glance whether they have neared that threshold. When viewing a client, you can select Applications to see how the data has been used by that client within the selected time period. Learn more about what is displayed in Applications below. Why is no data appearing for one of my Clients? There may be information to show for a Client for a few reasons. They may have no internet services associated with them, or they may not have consumed any bandwidth within the selected time period. 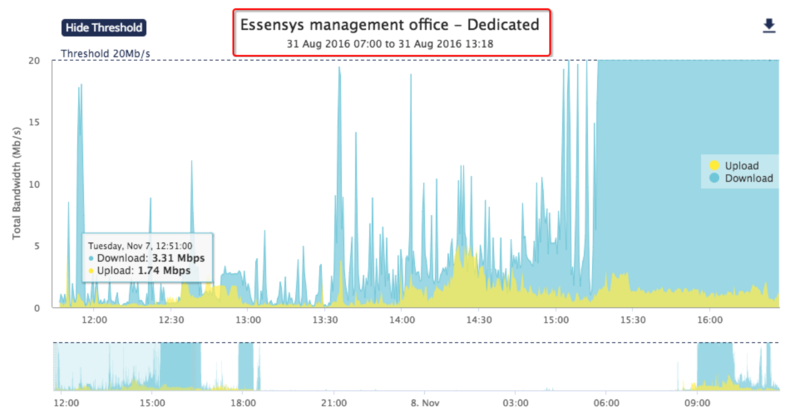 If you believe data should be appearing, contact the essensys team. Why does my data look different from the automated report I receive from essensys? If you receive a report from essensys showing the bandwidth used on pipes within your site, you will find that the data displayed does not match the Weekly and Monthly view on Connect. This is because different calculations are applied to the graphs within Connect to provide a more accurate indication of pipe usage. The enhanced graphs on Connect are design to replace the need for manual reports, as you can now rely on Connect to view pipe customer bandwidth usage in detail. 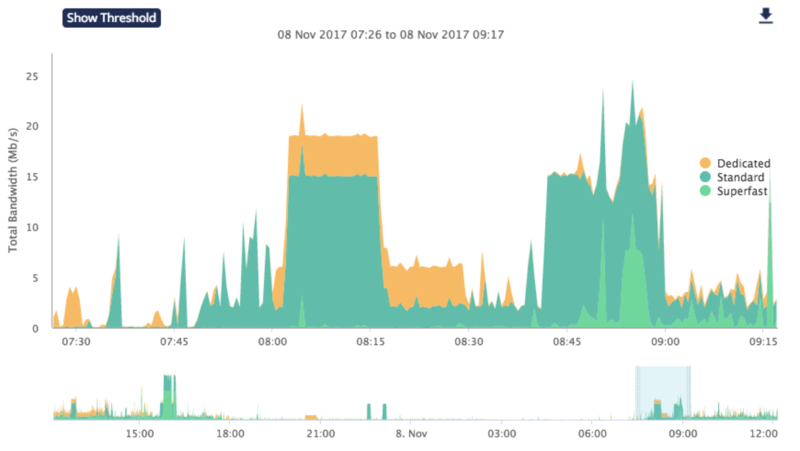 We suggest that you rely on the improved graphs within Connect as the source of truth when analysing data usage at your sites, and ignore, or cancel, any reports that you currently receive.